Will your Java developer resume land you an interview for this position? There are close to 4 million software developers in the US alone with an average job offer attracting 250+ candidates. Your Java resume must stand out from the crowd. Take a deep breath. Calm down. You’re exactly where you need. Get ready to make the best Java developer resume ever. A Java developer resume better than 9 out of 10 other resumes. How to write a Java developer resume that will land you more interviews. Tips and examples of how to put skills and achievements on a Java full stack developer resume. How to prepare the best Java developer resume job description section on a resume to get any job you want. Here’s a Java developer resume sample made with our online resume builder. Sample Java Developer Resume - See more templates and create your resume here. What’s the Best Format for a Java Developer Resume? It’s the go-to format for your Java developer resume if you want to focus the recruiter’s attention on your work history, achievements, and relevant skills—the Big Three that lands Java developer jobs. Your Java developer resume will come across as clear, concise, and successfully encapsulating the complex nature of your job in a visually pleasing manner. Just like a Java-powered solution should. If you’re a career changer you might also want to consider a combination resume. 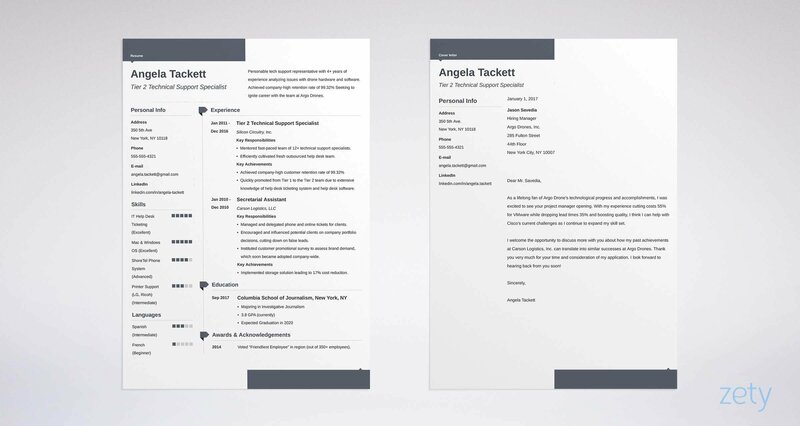 White space is your friend—both when coding and writing a resume. Export your Java developer resume to a PDF file to keep it in shape on any computer system and mobile device. We’re ready to move on to the first section of your resume. Still confused about the best format for your Java developer resume? Head straight to: Best Resume Format: Which to Choose? Java Developer Resume Objective or Summary? A lackluster opening paragraph will effectively dampen the hiring manager’s enthusiasm. You want to beat the other 250+ candidates. Knock them out with a Java developer resume objective or summary to remember. Here’s a quick look at the difference between a resume objective and resume summary. Java developer resume objective focuses on your skills and shows why you’re a perfect fit. Such opening statements are best for those with limited professional experience. Java developer resume summary summarizes your relevant work experience and greatest achievements. It is ideal for those with a few years of Java development under their belt. Skilled and well-organized computer science graduate with a BS from UCLA (GPA 3.9). Eager to join Inflitrix as a junior Java developer to help design game-changing e-commerce solutions. Developed a custom-made e-commerce cart module on RESTful. 3-month Java development internship experience at Oracle. A recent graduate with a degree in computer science. Would love to join the team at your company to develop his professional skills in a thriving environment. Outgoing and friendly. The first candidate knows how to show off their skills. They start with strong character traits, give an overview of their education, and academic achievements. They call the employer by name and say what they can offer. And finally, they mention two of their biggest achievements. Almost everything is backed by numbers. The other candidate’s objective lacks all these elements. It looks like a generic blurb anyone could write and send anywhere. Enthusiastic and well-organized Java developer with 3+ years of experience. Eager to join Infiltrix to bring in top-class Java development and problem-solving skills. In previous roles reduced app memory consumption by 30%, and decreased startup time for Java-powered apps by 70%. Experienced Java developer wishing to join your company in the role of a Senior Java Developer. Enthusiastic and motivated. The wrong example doesn’t say much. It even fails at showing the candidate’s enthusiasm and motivation—they didn’t even mention the company they’re applying to by name. Start with adjectives describing your strong traits. Specify your experience and/or skills. Back whatever possible with numbers. Think of your Java developer resume in terms of a resource library the recruiter has access to. Which section do you think is the most valuable? We’ll make sure your Java developer resume job description delivers like Guava. Browse through available senior or junior Java developer jobs. Find one that matches your qualifications and level of experience. Performs more comprehensive analysis and design for program changes to gain and to transfer knowledge of application changes. Reviews and prepares documents. Writes design documents (e.g. SRS, SDD). Defines development tasks and provides time estimates to aid in scheduling. May assign and coordinate tasks of others. Monitors progress against task estimates to provide status. Acts as a focal point to communicate department project activities and status. Applies application specific technical skills to independently produce deliverables (i.e. specifications, program changes, unit test scripts, documentation, etc.). Acquires and utilizes more in-depth business knowledge to support the applications. Recognizes code, process, and/or standard inefficiencies and makes suggestions for improvement, if applicable. Performs unit test plans to ensure all code changes meet requirements / specifications. Complies with and contributes to standards and procedures to ensure development consistency (e.g. programming standards, change management, version control). The yellow highlights indicate the skills the employer expects to see on the candidates’ Java developer resumes. These are the Java developer resume skills you need to focus on. The trick is to describe your Java developer skills in the language of the job posting. Analyzed and designed program changes. Reviewed and updated requirements documentation, wrote design documents (PRD, FRD, UIRD, TRD, SRS, and SDD). Applied relevant technical skills to deliver specifications, program changes, unit test scripts, and documentation. Planned, documented, and executed tests to ensure code changes meet requirements and specifications. Supported programming changes during quality assurance, user acceptance testing, and post implementation. The vast majority of large companies use ATSs (Applicant Tracking Systems). In fact, 98% of Fortune 500 Companies use them. An ATS (Applicant Tracking System) helps recruiters sift through the deluge of Java developer resumes they receive. The idea behind the ATS is pretty simple and ingenious at the same time. They parse resumes in search of keywords. The same keywords that were used in the original job posting. This is why your Java developer resume job description section must use the language from the job ad. If it doesn’t, the ATS will deem your coding experience irrelevant. Of all people, Java developers should know the importance of keywords. Once your Java developer resume passes the ATS test, it will end up on a recruiter’s computer screen. Now it must impress the recruiter too. Use resume action words—they will highlight your Java developer skills. Try to describe your experience in terms of achievements, not responsibilities. Achievements are your responsibilities backed up with numbers. If you find it hard to quantify each and every Java developer resume bullet, fret not. Pick out up to three achievements you’re proud of and put them in a separate key achievements subsection right under your responsibilities. Achieved a 30% reduction in the app's memory consumption by eliminating duplicate strings via Garbage Collection Logs analysis and refactoring the code. Recognized and improved code inefficiencies that led to a 40% increase in app stability. Responsible for analyzing and designing program changes and documentation. Responsible for specifications and scripts. Responsible for programming changes at all stages. Remember, your Java developer resume must always answer a specific job offer. What to include in the work experience section on an entry-level Java developer resume? The strength of an entry-level Java developer resume depends on its experience section. Yes, it’s true that internships don’t get you the money. But they get you much more than this—real-life experience. And this is exactly what your future employers will be paying attention to. 2. Previous gigs, freelancing, online presence. Do you code in your spare time? Do you help others cope with programming challenges? Make sure it doesn’t go unnoticed. Populate your junior Java developer resume experience section with your most prominent successes. You need to be more convincing. If your Java developer resume job description is done right, you’ve already said quite a lot. The skills the employer is looking for are already in your Java developer resume work experience section. They’re not listed as bullet points but rather shown in context. And this makes them even more impressive. Your skills need to gain more prominence on your Java full stack developer resume. First of all, look at the skills present in your job description and cherry-pick the ones you take pride in. Second of all, take another look at the job ad to see if the employer lists other skills (technical skills for example) that are crucial to succeeding in the role. Add them to your list. Now, put them in a separate key skills section on your Java developer resume. If you like, you can split the section into two. One for soft skills, the other for hard skills. Pro Tip: List up to 10 skills and go for the ones you’re proficient at. This way you’ll avoid the so-called presenter’s paradox. Scatter them throughout your entire Java developer resume. Put them in your opening paragraph, experience section, and a dedicated key skills section. Don’t go overboard in the key skills section. List up to 10 skills you’re best at. Focus entirely on relevant skills. Keep the job listing at hand to see what the employer is looking for in candidates. Your skills cannot be random. Pro Tip: Check if you have all the skills of a great Java developer here. You’ll get a job anyway. Take full advantage of the education section of your Java developer resume to up your chances of getting hired. Go beyond simple name-dropping. The school name isn’t enough. Add information on the relevant coursework and extracurricular activities that may contribute to your success in the role. The education section on your Java developer resume is particularly important on a Java fresher resume. It’s also quite sensible to pay attention to it on a resume for Java developer with 1-year experience. As your career progresses, recruiters will shift their attention to your professional achievements. So, when preparing Java resumes with 5+ years of experience limit yourself to graduation date, school name, and degree earned. Pro Tip: List your GPA only if it’s upwards of 3.5. How About a Cover Letter for Java Developer Positions? Writing a cover letter for a Java developer feels like coding in J2SE 1.2. Introduces you behind your achievements. Tell the story behind your Java developer resume. Make sure it’s well organized and clearly written. But that’s until you sit down to writing it. Our complete guide on how to write a perfect cover letter in 8 simple steps will help you. There’s more to writing a Java developer resume than listing your technical skills. Begin with a snappy Java developer resume objective or summary. Craft a compelling Java developer job description section. Format your Java developer resume elegantly. Get ready for the interview. Are you writing a Java developer resume for the first time? Or perhaps you’re a seasoned programming pro eager to help the rookies out? We’d love to hear from you, leave your comment below! How far back should a resume go? How many pages long should a resume be? Find your ideal resume length with help from this quick guide. A summary of qualifications sells your best points before the manager even reads your resume. Learn how to write a qualifications summary for your resume and boost your chances of getting an interview. This guide will give you actionable tips and the best examples sure to make your qualifications on a resume shine!